Photo(s) by Angela BrownWalk the pier while you're in Frankfort. Map out a fall color tour and add an exclamation point to the day with a stop at one of these roadside attractions in Northern Michigan. This article is featured in the October 2017 issue of Traverse, Northern Michigan’s Magazine. Subscribe for more travel ideas! With more than 8,000 feet of lake and river frontage, the St. Clair Lake/Six Mile Lake Natural Area near Ellsworth offers stellar autumn color viewing while hiking and paddling. Explore 7 miles of trail (1.25 wheelchair accessible) through marshes, cedar wetlands, fields and forests, and one of the longest undeveloped shorelines in the Elk River Watershed. (Parking lot, with canoe/kayak launch, off Ellsworth Road, 231.533.8576.) Post-exploration, stop by Bolt’s Farm Market, between Atwood and Ellsworth (9339 Atwood Road, or County Road 48) for corn, pumpkins, melons, winter squash and flowers. 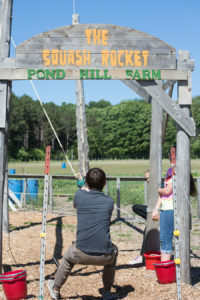 There’s something for everyone at Pond Hill Farm, a sprawling, family-owned complex located on the famously scenic Tunnel of Trees just north of Harbor Springs. Adults gravitate to the winery, brewery, café and miles of hiking trails. Kids take home memories of feeding the farm animals and bouncing along on a hayride that goes out to a trout pond. There isn’t anyone who doesn’t like loading the squash rocket and watching it sling gourds out into the farm field. Combine wine tasting with your color tour in Leelanau County, home to 26 wineries. 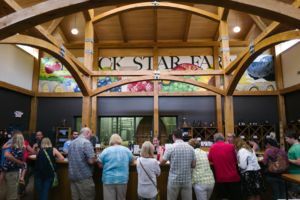 Explore this area’s three winery loops—Sleeping Bear, Northern and Grand Traverse Bay, snaking south to north along the Leelanau Peninsula. For light snacks (and al fresco sipping on a spacious patio), visit Rove Estate. Lake Leelanau’s Aurora Cellars offers award-winning wines served with small plates made with local food. Complete the day at Hahnenberg Farm Market & Cider Mill (555 S. Lake Leelanau Drive). This farm market offers in-season produce, comb honey, home-baked goods and natural apple cider. Forego four wheels and hop on your bike to take in fall’s golds, bright oranges and reds along the wooded Betsie Valley Trail, between Beulah and Frankfort. This 10-mile stretch of the 22-mile pathway serves up stunning views of Crystal Lake and the Betsie River. Start your journey on a Saturday morning at the trailhead in Beulah—you’ll arrive in Frankfort in time for the outdoor farmers market along the shore of Betsie Bay and the Frankfort harbor. The Frankfort Farmers Market is open year-round, downtown at the Open Space Park from 9 a.m. to 1 p.m. Find Michigan cherries, organic salad greens, braising greens, maple syrup, honey, goat cheese, eggs, local meat, and lots more. Take M37 (Center Road) north for a drive up Traverse City’s 22-mile Old Mission Peninsula. Orchards and wineries abound, and the sights are magnificent—catch panoramic views of both East and West Grand Traverse Bays. At the peninsula’s tip, loops of trails near Mission Point Lighthouse await—stroll the beach before escaping into the woods (trail signage offers up varying distances; terrain is easy to moderate in difficulty). Visit nearby Harbor View Nursery & Lavender Farm where you can peruse ever-expanding lavender fields, their 30,000 square foot pole barn used for lavender-drying, and a nearly 130-year-old barn. Look for the purple roadside stand; the farm boasts more than 40 products made with organic lavender and all-natural ingredients.